BAGHDAD (AP) – Seven years after the first bombs in the war to oust Saddam Hussein, Iraqis went about their business Friday with little observance of the anniversary, looking to the future with a mixture of trepidation and hope. Perhaps more important in the minds of many was the ongoing wait for final results from the country's second nationwide parliamentary election. The milestone will determine who will oversee Iraq as U.S. forces go home, but could also point the direction the fragile democracy will take down the road — deeper into the sectarian divide that followed Saddam's fall, or toward a more secular, inclusive rule. "Now we have democracy and freedom, but the cost was dire and Iraqis have paid that price," said Raid Abdul-Zahra, 38, a technician in Najaf. Prime Minister Nouri al-Maliki's coalition appears to be ahead in the tight race. With almost 90 percent of the vote counted as of Thursday, his coalition was leading in 7 of Iraq's 18 provinces compared to 5 provinces for his closest rival, the Iraqiya coalition led by secular Shiite Ayad Allawi. Al-Maliki's coalition also has about 40,000 votes more in the overall vote count. Many, especially among the country's Sunni-minority that dominated Iraq during Saddam's rule, blame the U.S. for the sectarian violence that erupted after the invasion. "Failure is the word that should be linked with the U.S war. The Americans brought people to power, but those people are specialized in reprisals, blackmail, inflaming sectarianism and robbing," said Mohammed Thabit, a retired teacher from Saddam's hometown of Tikrit. While violence has plummeted since the height of the bloodshed in 2006 and 2007, attacks continue, although in much smaller numbers. On Friday, at least five people were killed across Iraq. Three people died when a bomb exploded in the Sadr City slum in east Baghdad; gunmen killed an Iraqi soldier in Baghdad; and a roadside bomb in the northern city of Mosul killed an Iraqi soldier, police and hospital officials said. All spoke on condition of anonymity because they were not authorized to speak to the media. Many Iraqis view the U.S. withdrawal plans with mixed feelings — pride that their country is regaining its full sovereignty but also concern that the lull in violence may break and bloodshed return. "If the forces leave speedily, there will be a power vacuum and more problems will erupt because Iraqi forces are not loyal to Iraq but to their party affiliations," said Abdul-Karim Moussa, 55, in Baghdad. Others think the violence will dissipate after the U.S. pulls out. "I think the violence will vanish after the American withdrawal because they are causing the violence. They entered Iraq to steal its natural resources," said Ahmed Abdul-Hussein, 55, in Kut. In Sadr City, the stronghold of anti-American cleric Muqtada al-Sadr, Sheik Suhail al-Akabi described the anniversary as the "ominous day of the invasion," and called for a demonstration on April 9, the anniversary of Baghdad's fall, "to call for the departure of the occupying forces." Al-Sadr's followers have been some of the most adamant voices calling for U.S. troops to immediately leave Iraq. The U.S. military said there were no ceremonies or special events to mark the anniversary. At least 4,386 U.S. military personnel have died in Iraq since the war began, according to an Associated Press count. Those numbers have tapered off significantly as violence has dropped and U.S. forces have limited their operations as part of the U.S.-Iraq pact under which American forces pulled out of Iraqi cities. Last year, 152 American service members died in Iraq, compared to 314 a year earlier, according to figures compiled by The Associated Press using data from the U.S. Defense Department. The number of troops in Iraq has also dropped significantly since the height of the war in October 2007, when the U.S. had about 170,000 troops in the country. About 95,000 remain, and that number is expected to fall to 50,000 by the end of August under President Barack Obama's plan to remove all combat troops from the country. All American troops are scheduled to leave by the end of 2011. 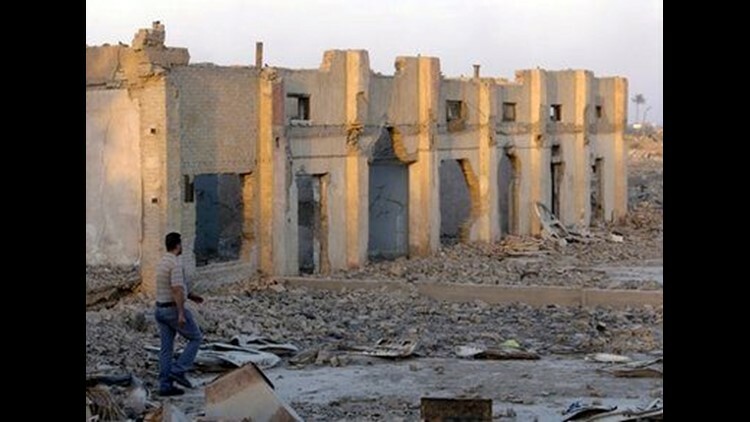 According to figures compiled by Iraq's Human Rights Ministry and released last fall, 85,694 people were killed from the beginning of 2004 to Oct. 31, 2008 and 147,195 were wounded. The figures include Iraqi civilians, military and police but do not cover U.S. military deaths, insurgents, or foreigners, including contractors. And it did not include the first months of the war after the 2003 U.S.-led invasion. However, those figure are widely considered a minimum because many so many deaths went unreported. The war in Iraq has cost more than $712 billion, according to the National Priorities Project. Associated Press writers Bushra Juhi, Sameer N. Yacoub and Katarina Kratovac contributed to this report.